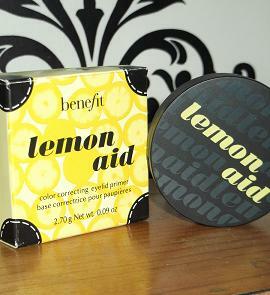 Benefit is definitely a brand which should be praised more often. Not only is the packaging for every single product unique and gorgeous, but their products, especially the iconic Bad Gal Lash mascara, are absolutely amazing. 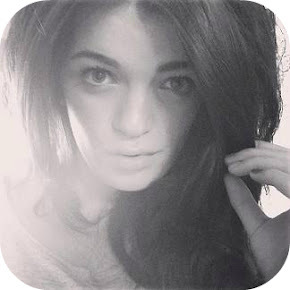 I had my make-up done by a professional in Debenhams a few years ago and I fell in love instantly with their range. It's so girly and cheerful, although some products are a bit on the pricey side. I've always suffered with tired looking eyes even when I get my full 8 hours of sleep. I think I was just born with dark circles under my eyes and I've tried every concealer possible to hide them. I've found a fair few which do the trick, but I picked up Lemon Aid a few weeks ago to see if it really does what it says on the tin. 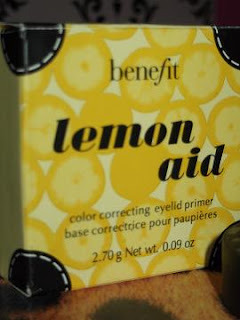 Lemon Aid is a 'colour correcting eyelid primer' which also makes eye make-up such as eye shadow, highlighter and contouring look alot nicer and smooth. I used a concealer brush to apply this particular one. Its quite a creamy formula, so glides on easily and is a dream to blend and soften around the eyes. Because the pigmentation is a soft yellow, a minimal amount is required to do the job. You can always build it up, but once there's too much it's difficult to take it away. The compact comes with a small mirror on the inside so it's perfect to fit in your make-up bag. Although it's a little on the pricey side at £16.50, it's well worth the splurge and will last alot longer than concealers which come from pens. Do you like Benefit products? Have you tried Lemon Aid, what did you think?